The olive is one of the 3 core food plants in the Mediterranean diet, the others are wheat & grapes. 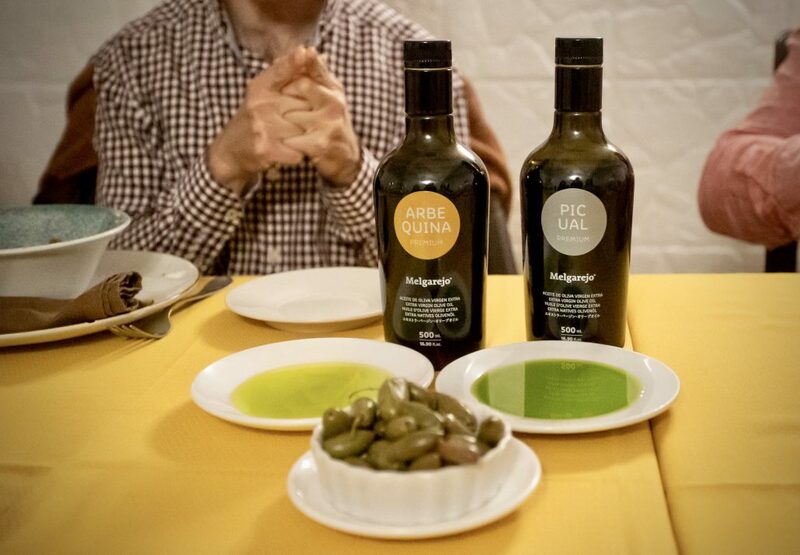 Olive Oil is the cornerstone to the Mediterranean diet as it consists of mainly oleic acid which is dubbed the ‘healthy fat’ due to its many health benefits including to the; heart, brain, mood, skin, cells and (believe it or not) waistline. Oleic acid is also found in the acorns eaten by the Iberian Pig, hence the fat from the Iberian pigs, found in Jamon, (Manteca Iberica) being a healthy fat. (Find out everything you need to know about Jamon here). 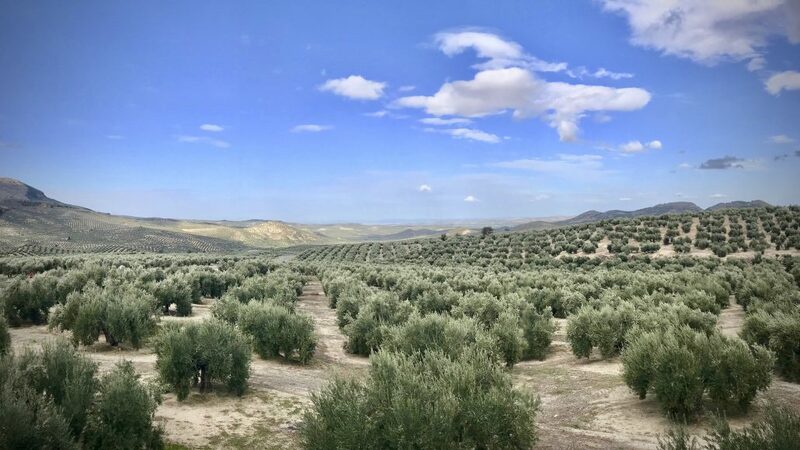 Driving north to Jaen through millions of olive trees, we met with Manuel Jesus Sutil Garcia, head of the Consejo Regulador, DO Sierra Magina at their beautiful headquarters in Bedmar. With him was Juan Balbin Garrido, the agricultural minister for Jaen, who is campaigning to unite the 3 separate DO’s in Jaen (Sierra Magina, Cazorla and Segura) under the same umbrella; DO Jaen. They are waiting for approval of the EEC to make this happen. 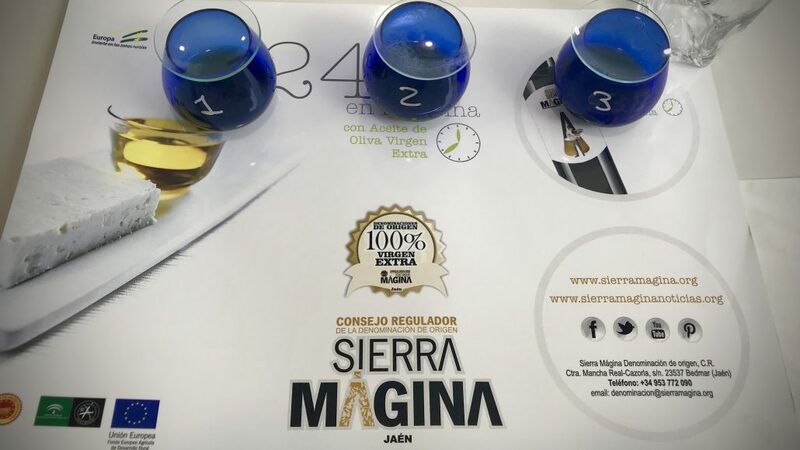 The predominant olives of the 60,000 hectares of DO Sierra Magina are Picual and Manzanilla de Jaen. Picual is responsible for all their Extra Virgin Olive Oils (EVOO). There are 29 Olive Oil firms in and around 15 villages producing a staggering 2 million litres of olive oil each year. 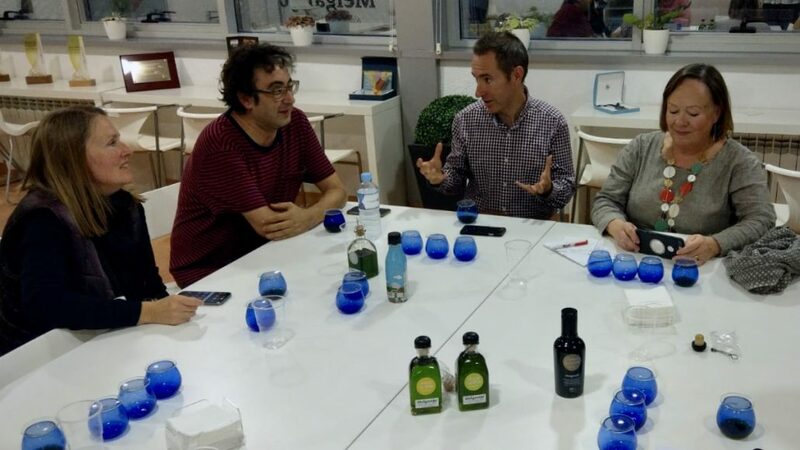 We were shown around the tasting room where the professional tasters, ‘noses’, sit in small cubicles rating samples of the oils as they come in after harvest. They taste the oils in small blue glasses without any information at all. A blind tasting. 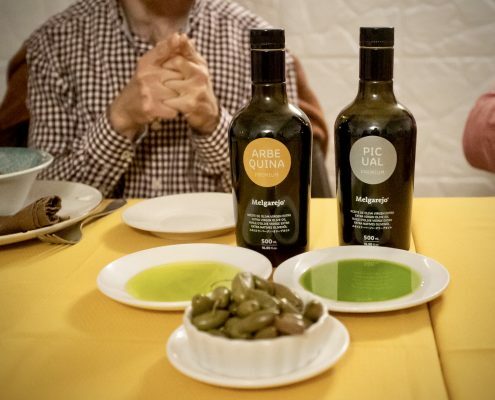 They are looking for defects, such as too much acid, the oil is then rated as Extra Virgin Olive Oil or Virgin Olive Oil. Blind tasting at DO Sierra Magina. The lower the acidity, the better the EVOO. Now it was our turn to rate the oils at a blind tasting. We sat in the boardroom with 3 little blue cups with glass lids. Blue so you can’t be influenced by the colour of the oil. A plate of apple slices to clean palates between each oil looked dull and insipid in comparison. No 1 I liked – but then I was told it was full of defects. No 2 was yummier – but I was told it was old. Number 3 was a sensation in the mouth. I wished then for a fairy Godmother to arrive with a plate of Lola’s (Clisol) tomatoes and a large glass of chilled Fino. No 3 was the lowest in acid, it was premium extra virgin Picual. The size of the olive is no indication the amount of oil contained within – it just means it contains more water. The oil content will always be the same regardless of size. Getting the most unexpected surprise at lunch in Pegalajar! Lunchtime beckoned but given the remoteness of our location, there was a level of anticipation. The thing about Andalucia is that food is one of the most important aspects of daily life. Quality food. Slow food. The adage ‘the simpler the better’ is often true here. We followed Manuel up a very twisty mountainous road with rocks on one side and a sheer drop on the other (protected by bollards thank goodness), and olive trees as far as the eye could see. Our little bus laboured around each bend until suddenly we plateaued and started descending into yet another valley and the charming small town of Pegalajar. Here we were entertained to the most spectacular food, in what was almost the middle of nowhere, it absolutely blew us all away! Alcuza de Pegalagar is a family run, understated, and unassuming restaurant. Mum and son in the kitchen, dad behind the bar. We walked in, presented ourselves at the bar and all I could think of was a chilled Manzanilla. “I don’t suppose….” I started, which to my surprise was followed by ”Si Manzanilla en Rama de Sanlucar”. I instantly knew this place was going to be great! 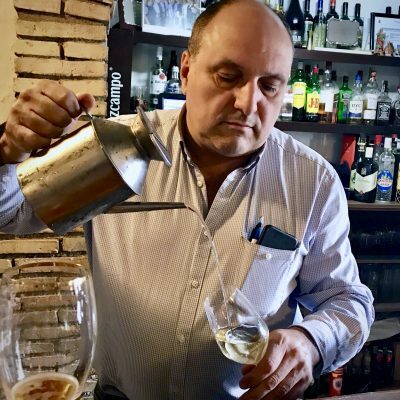 En Rama (meaning unfiltered sherry) was poured out of a stainless steel Olive Oil pourer, the type used in kitchens but this one was LARGE, almost like a watering can, straight from his fridge and served in a white wine glass alongside a plate of warm mini chorizos. Lunch started with 2 fabulous Olive Oils from Melgarejo, the Almazara we were to visit after our lunch. 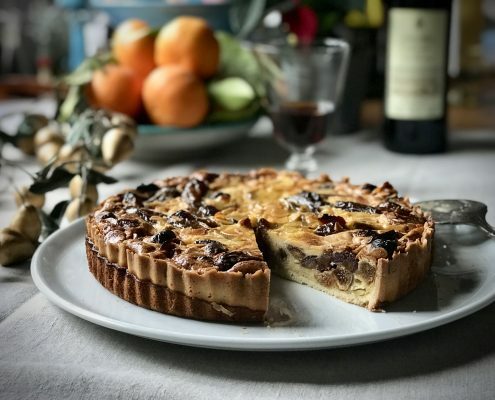 Some long green Cornicabra olives and warm bread lead the way to 5 savoury dishes including artichokes, prawns, hake, aubergines (hollowed out, deep fried & filled with salmorejo), a selection of meats and a pudding plate of mixed delights, which was served with a glass of Port. Delicious wines were served throughout, including La Panesa Fino de Jerez which paired perfectly with the artichokes. Eventually, we had to drag ourselves away from the table to head up the hill to Melgarejo to watch the production from olive to oil. Award-winning EVOO from Melgarejo. Arbequina, Hojiblanca & Picual. The oils are vibrantly green. Melgarejo is a family run enterprise producing highly regarded, award-winning EVOO, with exports reaching as far as Japan. They offer a range of Premium EVOOs from olives other than Picual. 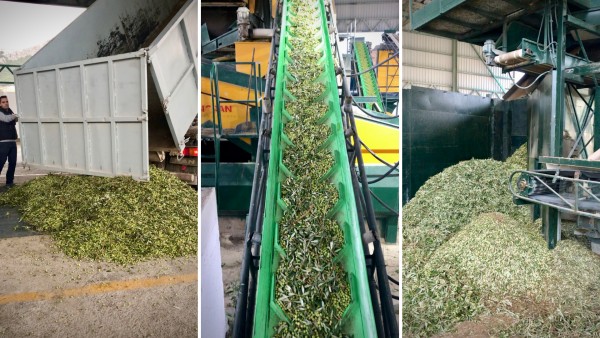 Their modern facility was busy as it was harvest time, and lorry loads of freshly harvested olives were constantly arriving. Following de-stemming, it was straight into the press. The air was heavy with fresh green grass, the scent of the freshness of the olives. The tasting consisted of this season’s Arbequina, Hojiblanca & Picual. The colours in the bottles were vibrantly green, oozing with chlorophyll. Leaving the tasting room via their tiny shop, I just couldn’t resist a bottle of each of the Hojiblanca (my prefered oil for Ajo Blanco) and the Picual, as it was some of the yummiest EVOO I’ve ever tasted. The trendy labelling of the bottles will enhance any kitchen. Everywhere I went I met people who were passionate about what they were doing with the focus being environmentally friendly food production techniques. Wherever I went, it was all slow food. Zero miles. Nothing I saw was imported (only pineapples, but I don’t eat them!). The contrast of the landscape between eastern and western Andalucia really impressed me; the west having the desert of Almeria, and the vineyards at the foot of the Sierra Nevada. 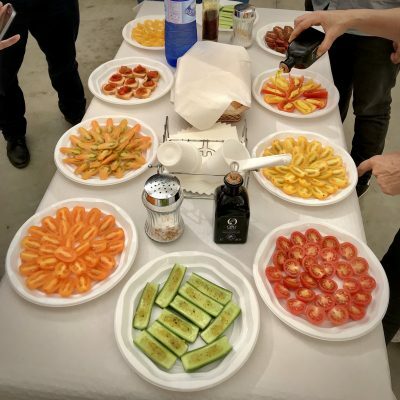 The sustainable agriculture being pioneered in the polytunnels in Almeria was particularly surprising, this was something I previously did not understand. 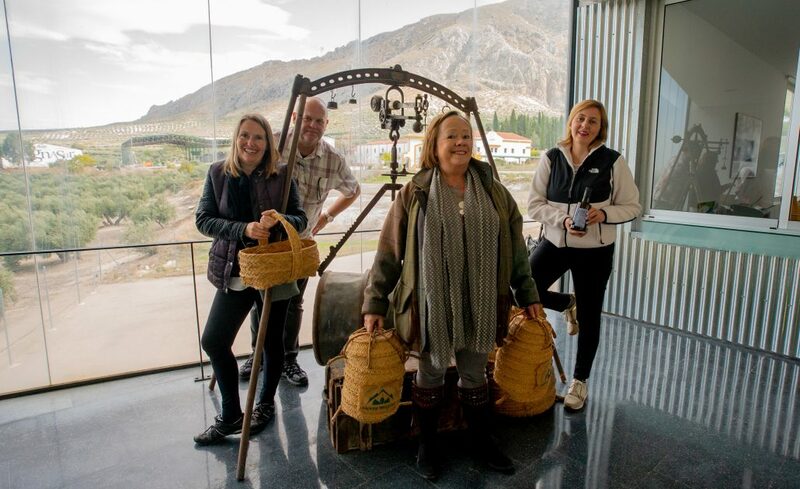 The fabulous ‘lonja’ (fish auction) at Almeria port, the sheep’s cheeses (here in the east we have goat’s cheese) & artisan wines of Granada. The enormity of the Olive Oils production of Jaen. And of course the raisins and Moscatel of Malaga. 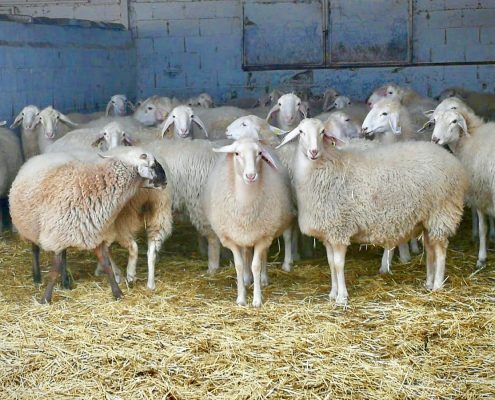 Andalucia could be a self-sufficient state. It certainly has everything I want and need. 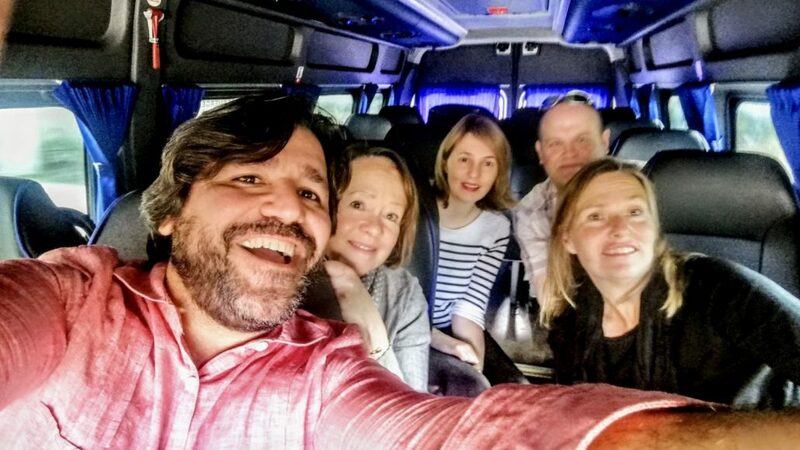 Thank you to my fellow travellers Erik, Molly, Zorra and Rafa for the the fun, laughs and shared enthusiasm for everything we experienced.